VA Form 10-1314 or the "Hsr&d Carer Development Awardee Annual Progress Report" is a form issued by the United States Department of Veterans Affairs. 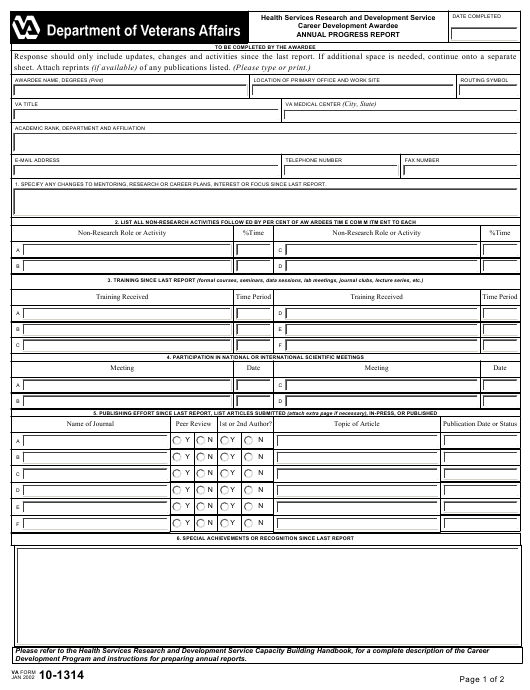 The form was last revised on January 1, 2002 - an up-to-date fillable PDF VA Form 10-1314 down below or find it on the Veterans Affairs Forms website. 1. SPECIFY ANY CHANGES TO MENTORING, RESEARCH OR CAREER PLANS, INTEREST OR FOCUS SINCE LAST REPORT. Development Program and instructions for preparing annual reports.